In 2018, nearly 3,100 Android devices were certified by Google. With so many new Android smartphones in the market, it’s become increasingly difficult for device makers to differentiate their products from the competition. We’ve watched as the industry has moved towards bezel-less displays by incorporating display cutouts (notches), but near the end of 2018, we’ve seen companies experiment with slider mechanisms and in-display cameras. For example, Honor, Huawei’s sub-brand that sells products online, unveiled the Magic 2 in late October and View 20 in late December. The Honor Magic 2 is the company’s latest experimental, nearly bezel-less smartphone with a slider camera mechanism, while the Honor View 20 has a punch hole in-display camera. Unlike the Magic 2, the Honor View 20 will be sold outside of China. 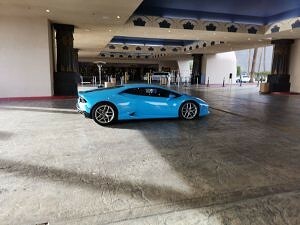 We had the opportunity to check out the View 20 at CES 2019 ahead of its global launch. Here’s what we think of Honor’s View 20 flagship Android smartphone. Availability China: Announced December 26th, 2018. On sale. *Information obtained from analyzing the Honor View 20’s kernel source code. There are two areas where the View 20 really stands out from the competition: its display cutout and its glass back. The View 20 is the first smartphone from Honor with a display hole, so there’s a lot for us to talk about there. Having a glass back doesn’t make the View 20 unique, but the finish they’ve applied has resulted in a device that I’ll be hesitant to slap a case on top of. When smartphones with display notches started appearing, it took a few iterations for me to really be comfortable with them. The OnePlus 6 was the first smartphone whose notch I grew tolerated; the OnePlus 6T was the first smartphone whose notch I actually liked. 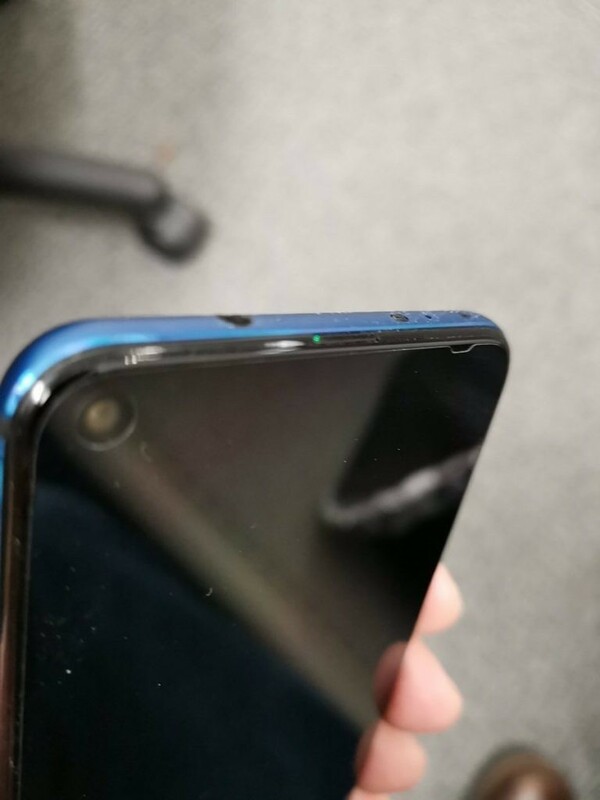 The display hole on the Honor View 20 is about the size of the smaller waterdrop notches I’ve seen on the OnePlus 6T and Huawei Mate 20 X, except its position has been shifted to the left. When compared to a waterdrop notch, there are two main benefits: The status bar is continuous so a greater number of notification icons should be visible, and they’re less intrusive when playing games or watching videos. The off-center display hole may look awkward at first, but you’ll appreciate how it doesn’t get in as much of the way as a centered notch. However, there’s one drawback to the View 20’s display hole approach: the lack of space for more sensors. The Honor View 2 has a single front-facing 25MP Sony IMX576. The very slim top bezel houses an earpiece speaker and an LED for notifications (a welcome addition!) There’s no room on the top bezel for an extra speaker or secondary front-facing camera. 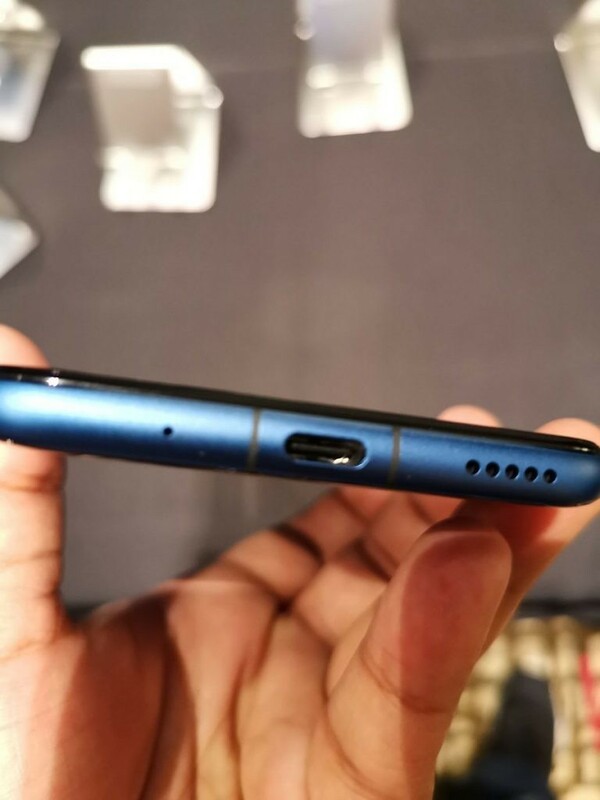 (The gargantuan Huawei Mate 20 X manages to place both a speaker and a 3.5mm headphone jack on the top, but that device is in its own size class.) As a result, there is no wide-angle camera lens like on the Pixel 3, and the single bottom-firing speaker can’t produce audio that’s very loud, according to TK Bay from our XDA YouTube channel. We praise Honor’s decision to keep the 3.5mm headphone jack. While the company removed the jack on the Honor Magic 2, they’ve decided to keep the jack on the View 10’s successor. The Honor View 20 is also one of the few smartphones with an IR blaster. Typically only Huawei and Honor flagships have an IR blaster these days, so we’re not surprised to see one on the View 20, but we’re happy it’s still there. Lastly, the presence of an LED flash for notifications was a nice surprise for me, since I’ve managed without one on the OnePlus 6T. Although some of the marketing images may make it seem as if the View 20 has a non-existent bezel, there is, in fact, a really slim bottom bezel. It’s really slim, though. 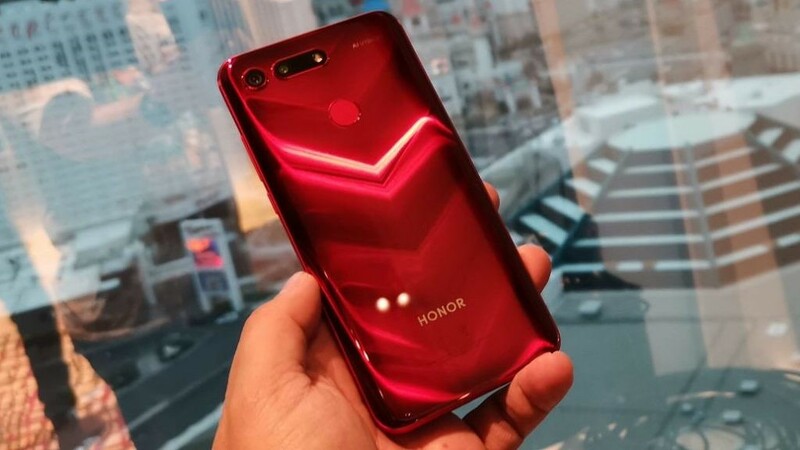 I suspect that Honor is using the same chip-on-film technology they employed when manufacturing the Honor 8X, though I don’t have any confirmation. Whatever they did, the result is a 91.82% screen-to-body ratio. When you’re watching videos, almost the entire display is used to show the content. It’s not as immersive as watching videos on the Honor Magic 2, but it’s damn close. Lastly, let’s talk about that glass back. 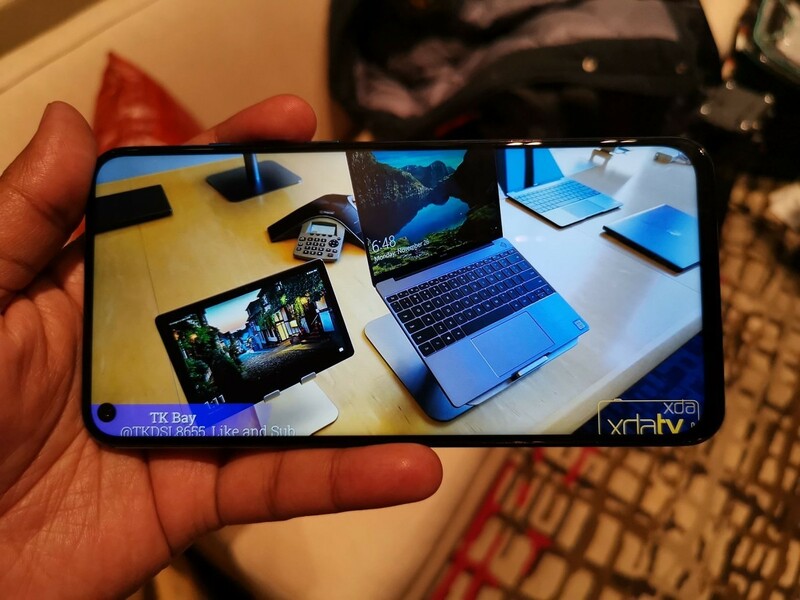 Before the View 20’s launch, a source told me that the smartphone would have a “really cool new glass design” with “shimmery colors.” Lo and behold, the View 20 was announced in China with renders showing an interesting V-shaped pattern that appears when light is shined on the back at an angle. When I first heard this information from my source and saw the official renders, I underestimated how “shimmery” the colors would really be in-person. 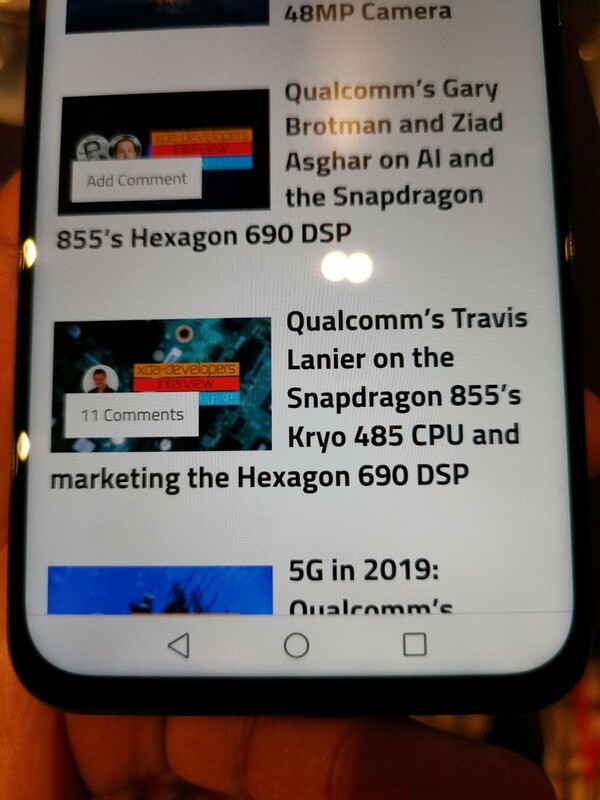 I expected something like the OnePlus 6 and OnePlus 6T’s S-shaped shimmer line. What I got was far more striking. You don’t need to stare at the View 20 all day to see the shimmer effect—it’s really easy to see. I was able to see the V-shaped shimmer from several feet away in the hotel suite where the pre-briefing was held. The effect isn’t at all subtle, and that’s great because it’s beautiful. This is one of the few smartphones I will hesitate to put a case on top of—the OnePlus 6T Thunder Purple is another such device. 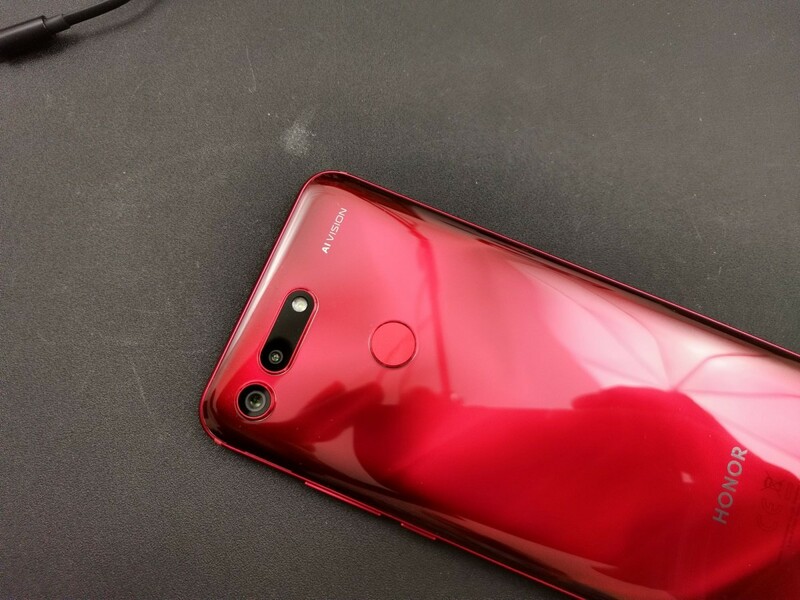 In hindsight, I should not have underestimated Huawei and Honor’s design capabilities after seeing what they did with the Huawei P20‘s gradient colors and the Huawei Mate 20 Pro/Mate 20 X’s “Hyper Optical Pattern” glass texture. The Honor View 20 is a substantial improvement over the Honor View 10 in terms of picture-taking. Honor has packed a 48MP Sony IMX586 sensor—the first device to do so—as well as a Sony IMX316 3D Time-of-Flight camera, on the rear of the device. The single front-facing camera is a 25MP Sony IMX576, the same one used on the Huawei P20, P20 Pro, Mate 20, and Mate 20 X. While the front-facing camera isn’t too special (only because Huawei and Honor have already set such a high standard), the rear camera setup lets the View 20 stand out even when compared to the Huawei P20 Pro and Huawei Mate 20 Pro. A high megapixel count is nothing new for Huawei, Honor’s parent brand. After all, the Huawei P20 Pro, Huawei Mate 20 Pro, and Huawei Mate 20 X all have a 40MP Sony IMX600 primary rear camera sensor. (I verified the IMX600 information by looking at the kernel source code for the P20 Pro, Mate 20 Pro, and Mate 20 X.) Those smartphones produce beautiful high-resolution pictures when you enable the 40MP mode, so how much improvement would the View 20’s 48MP camera offer? We haven’t had the opportunity to do a full comparison yet, but one thing we did want to take a look at is Honor’s “AI Ultra Clarity” mode. This feature has no equivalent on the P20 Pro, Mate 20 Pro, or Mate 20 X. When 48MP AI Ultra Clarity mode is enabled, the View 20 takes several 48MP pictures in 5 seconds, processes the images, collates the pictures, and finally, creates one, really sharp 48MP photo. Thus, you have the option on the Honor View 20 to either take a single 48MP shot basically no lag or a much higher-quality 48MP shot using the AI Ultra Clarity mode. Preview images of the sample 48MP photos with and without AI Ultra Clarity we took on the Honor View 20. Left: 48MP without AI Ultra Clarity. Right: 48MP with AI Ultra Clarity. The uncompressed photos can be viewed here. If you want to see a 48MP camera sample with and without AI Ultra Clarity mode, you can check them out in this Google Drive folder. These photos were taken by TK Bay on his review unit. As an example of the quality of the AI Ultra Clarity mode, there’s a speck of dust next to the “AI Vision” word in the sample photo that you can only see if you zoom in. We chose not to embed the original resolution photos in this article because they’re huge and would dramatically increase the article’s load time, so we recommend you view the uncompressed photos in the Drive folder. You can see more 48MP camera samples taken from an Honor View 20 by visiting this article. However, do note that these images were provided by Honor themselves. In our top smartphones of 2018 article, I praised the Google Pixel 3’s Night Sight mode as it’s the best implementation of handheld long-exposure on a smartphone to date. However, even if Google’s is the most impressive, Huawei’s implementation was the first to do it really well. Introduced on the P20 Pro, Huawei’s night shot mode collects light for up to 5 seconds, what Huawei calls Artificial Image Stabilization (AIS) to reduce the effects of your hand shaking, and computational photography techniques to produce a better exposed image. I wasn’t able to test the AI Super Night Shot mode on the View 20, but if it’s anything like on the Mate 20 X (and I’m willing to bet it is), then it will certainly impress. We’ve talked extensively about the overuse of the terms “AI” and “NPU” in our various interviews with Qualcomm executives, but Huawei’s marketing of the Kirin 970 and Kirin 980‘s NPU(s) has definitely taken hold in the minds of consumers. One advantage that Huawei has over Qualcomm in this regard is their ability to directly put their mobile platform’s AI capabilities to use in software features on smartphones. While Qualcomm has made impressive strides in AI compute, they’re only able to show us the work done by their partners—features which may or may not end up in future Snapdragon 855-powered smartphones. Meanwhile, Huawei has actually shipped impressive software features like real-time object recognition in videos. For example, on the Huawei Mate 20 Pro and Mate 20 X, you can activate a video mode to blur the background or make it black-and-white in real-time video recordings. (Here’s an example of the “AI color” mode on the Mate 20 Pro.) The Honor View 20, unlike the Honor Magic 2, supports these video features. Time of Flight sensors measure the depth by resolving the distance between the ToF sensor and the object based on how long it takes the light to travel. ToF camera sensors are used to enable 3D mapping at a distance, most commonly for facial recognition purposes as seen on the Mate 20 Pro, iPhone X, and Xiaomi Mi 8 Explorer Edition. Unlike these devices, however, the Honor View 20’s ToF sensor is on the rear of the device. 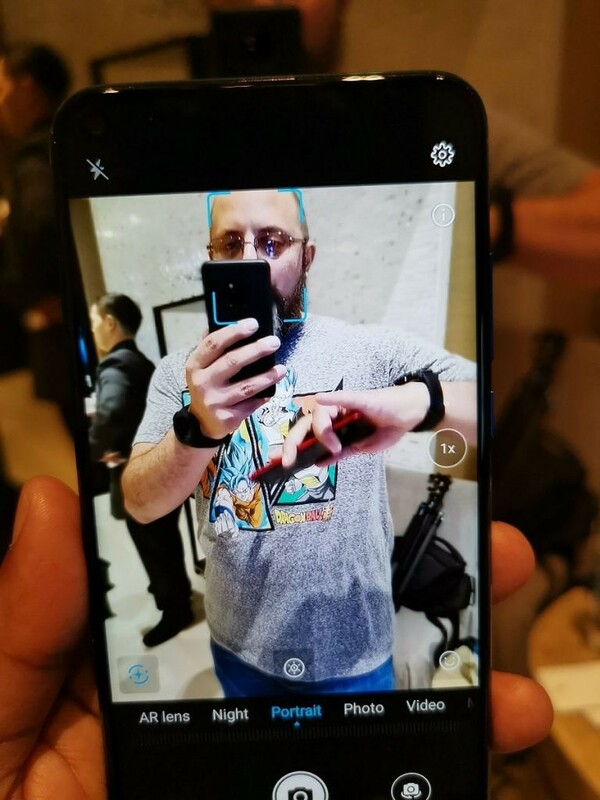 That means it’s not used for facial recognition—the View 20 uses a software-based solution with imaging data provided by the single front-facing camera for that—but there is a method to Honor’s madness. Honor is using the 3D ToF sensor for 3 features: 3D shaping, 3D motion-controlled gaming, and AI calorie counting. 3D shaping and 3D motion-controlled gaming were usable on our review unit and the units on display at CES, while AI calorie counting is said to arrive in a future update. 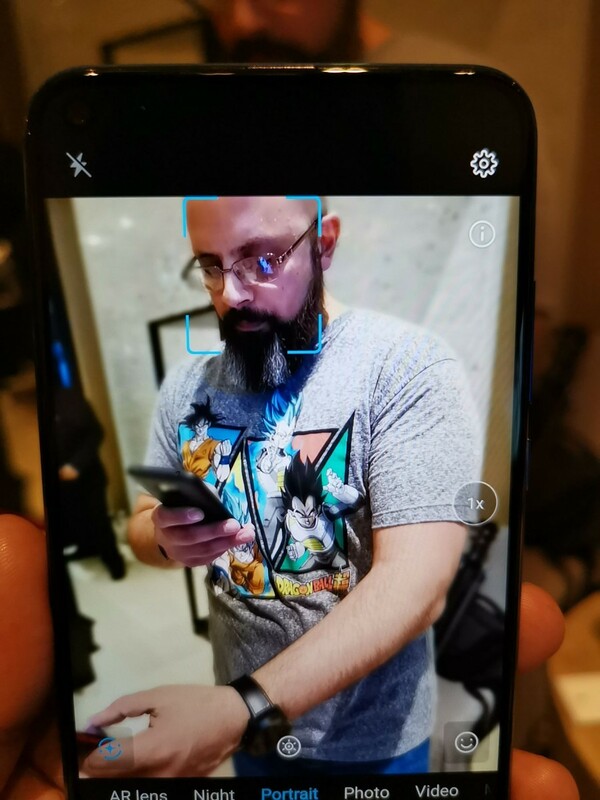 The Honor View 20 can basically act like a Microsoft Kinect in that the ToF camera can be used to detect your body’s motion when playing certain games. If that sounds gimmicky, that’s because it is. While it’s certainly fun to play around with, I highly doubt many games will be taking advantage of the View 20’s 3D camera. 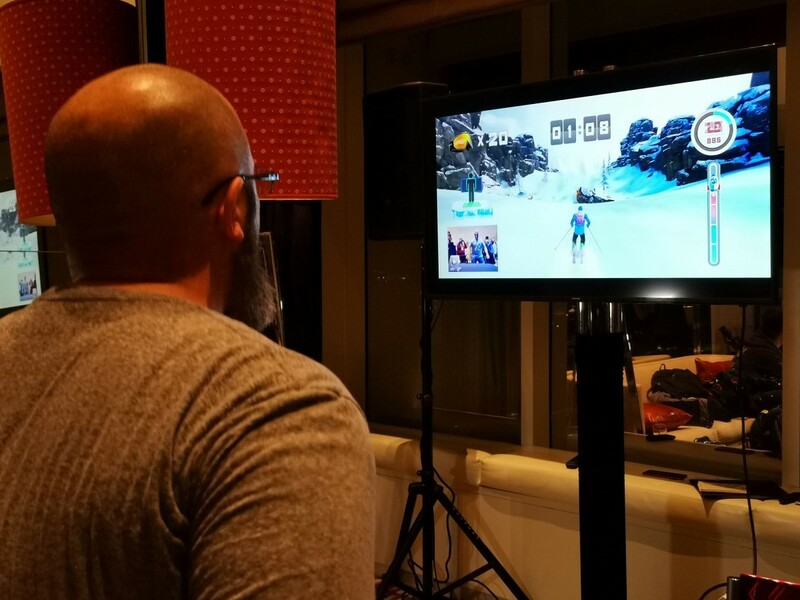 To use the 3D camera for motion-controlled gaming, you have to connect your phone to a monitor using either Miracast, a USB Type-C to HDMI adapter, or a special dock made by Honor. I’m glad that Honor didn’t gate this feature behind their dock, but again, I don’t see very many games taking advantage of this. Speaking of gaming, Honor state the View 20 has a “9 liquid cooling system” that should result in a 5 degrees C improvement in device temperature. We haven’t gamed on the device long enough to tell you if these claims are true, though. If you’re wondering about Link Turbo or AI Calorie Counting, we’re sorry to say that neither feature was available on our devices. Link Turbo allows for Wi-Fi and LTE to be used simultaneously to speed up connectivity. The software intelligently decides which connection to use for which purpose. Calorie counting already exists in HiVision on the Mate 20 series and Magic 2, but it’s pretty awful as is. We’ll have to wait and see how it fares once the 3D ToF sensor is used. Lastly, there’s no word yet on whether the Mate 20 Pro’s 3D scanning app will be made available for the Honor View 20. We tried installing it but it wouldn’t work. The built-in theme engine is surprisingly robust and lets you even customize framework and SystemUI elements. Of course, you can customize fonts, icon packs, wallpapers, etc. 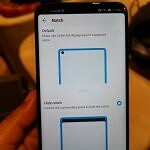 Huawei offers multiple options in place of the navigation bar. Besides gestures, you can also enable a navigation dock that can be moved anywhere on the screen. Easy Projection is great because you can use any USB 3.1 Type-C to HDMI adapter to enable a desktop-like interface for basic document editing, web browsing, etc. while on-the-go. You can even use Easy Projection wirelessly via Miracast on EMUI 9. Here’s a demonstration of wired Easy Projection on the Mate 20 X, but it’ll work the same on the View 20. 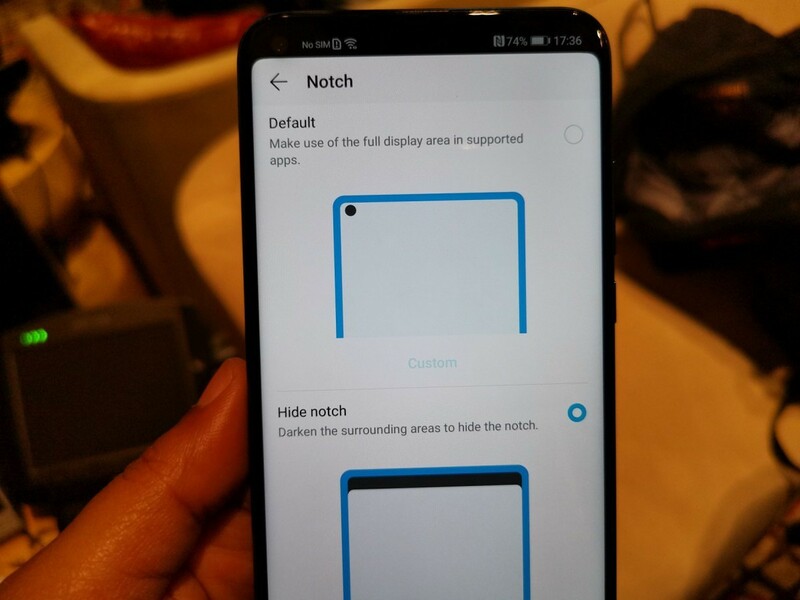 You can hide the notch using a built-in setting. Digital balance, Huawei’s version of Google’s Digital Wellbeing, lets you manage your smartphone usage. You can make it control how often your kid uses their phone, which is something that Digital Wellbeing doesn’t let you specify. You can also set a PIN so the settings can’t be modified. While Google shows you a pie chart, Huawei shows your screen time in a more friendly-to-view way. Huawei offers a few useful gestures like automatically lowering the volume of a call when lifting the phone, answering a phone call when the phone is lifted up to your ear, or flipping your phone to mute incoming calls/alarms. The only downside is that you have to train yourself to use them. There are also knuckle gestures called FingerSense, powered by Qeexo, but I personally find them annoying to activate so I disable them. If you’re integrated into the Google ecosystem, then HiBoard in the EMUI 9 launcher may not be your cup of tea. If you disable HiBoard via ADB, Huawei actually defaults back to using the Google Discover/Feed. Not even the OnePlus Launcher does that! The bootloader can’t be unlocked. At least, not officially. EMUI 9 will kill your apps if you don’t disable its aggressive battery optimization services. I wasn’t receiving any notifications from Slack or Discord on my Mate 20 X until I went into Phone Manager and toggled the right settings. The same will be true for the Honor View 20. The full-screen gestures need some work. I love that Huawei thought of screen pinning and one-handed mode when designing the gestures, whereas other OEMs’ gesture solutions simply disable features like screen pinning. I’m annoyed by the fact that there’s no quick switch gesture to go to the previous app—you have to swipe up and hold, let go, then tap on the previous app’s card. I’m also annoyed by the fact that the back button gesture is activated from the two sides of the screen—this frequently interferes with app sidebars and even Huawei’s own launcher app drawer! HiVision is useless and needs to be replaced by Google Lens. The Emy voice assistant is useless and needs to be fully replaced by Google Assistant. Huawei’s launcher has some quirks. As I just mentioned, the launcher’s app drawer really doesn’t work well with the gestures. You have to remember to swipe up from the bottom to exit the app drawer and not swipe from the sides to go back. The home screen can’t rotate. With many OEM launchers adding swipe up gestures to show the app drawer, it feels archaic for Huawei to only offer an app drawer button as an option. App Twin (cloning an app to use a second account) is arbitrarily restricted to only a handful of apps. I know it’s technically possible for them to clone any app because I’ve done it on EMUI 5. There’s no dark theme by default. Actually, there is, it’s just arbitrarily disabled on certain Huawei and Honor devices. The Huawei Mate 20 Pro and Mate 20 X have it while the Honor Magic 2 and Honor View 20 don’t. Fortunately, EMUI has a built-in theme engine so you can install third-party dark themes that way. EMUI 9’s Chinese version can’t use third-party launchers, so be wary of that if you decide to import the device from China. Notifications on the lock screen are still a mess. You can’t expand them fully to choose an action to immediately perform after unlocking the device. Check out this video by TK Bay over on the XDA YouTube channel. He spent some time with the Honor View 20 in Phantom Blue and Red. If you’re interested in another view (no pun intended) on the View 20, then check out the first impressions of the device from our sister site PocketNow. Overall, I’m really impressed by what the Honor View 20 has to offer and look forward to getting one to do a full review. Depending on its price, it could be a hit in places like Europe and India, where it’ll launch on January 22nd and 29th, respectively. The Kirin 980 is a great chip, EMUI has improved a lot since the last time I daily-drivered it (EMUI 5), the design is stellar, and the camera is really promising. EMUI 9 still has its fair share of (fixable) annoyances and I would rather choose the Pixel’s software or OxygenOS over it, but it’s grown on me lately. I would prefer the device have an in-display fingerprint scanner and 40W fast wired charging, but compromises have to be made somewhere to keep the prices down. The Honor View 20 is going to be a great choice unless the lack of bootloader unlocking is a deal breaker for you. 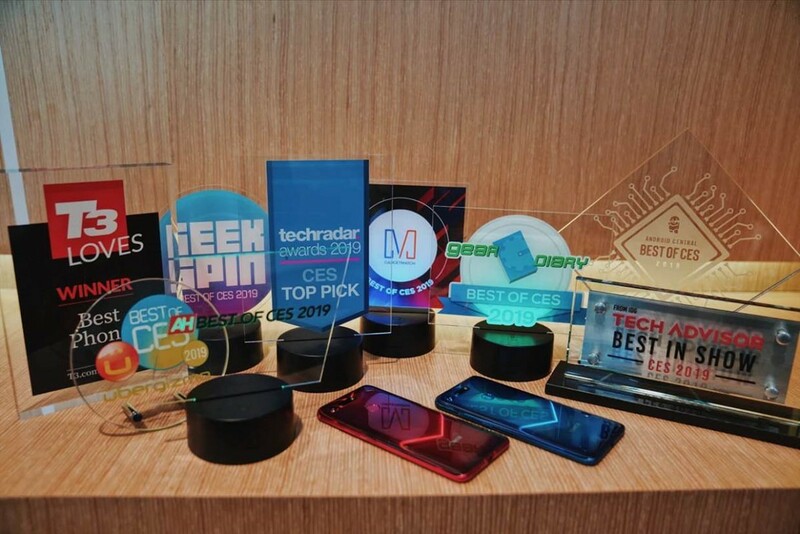 It’s not just me that’s saying that, though, as the device won multiple awards from publications attending CES 2019. 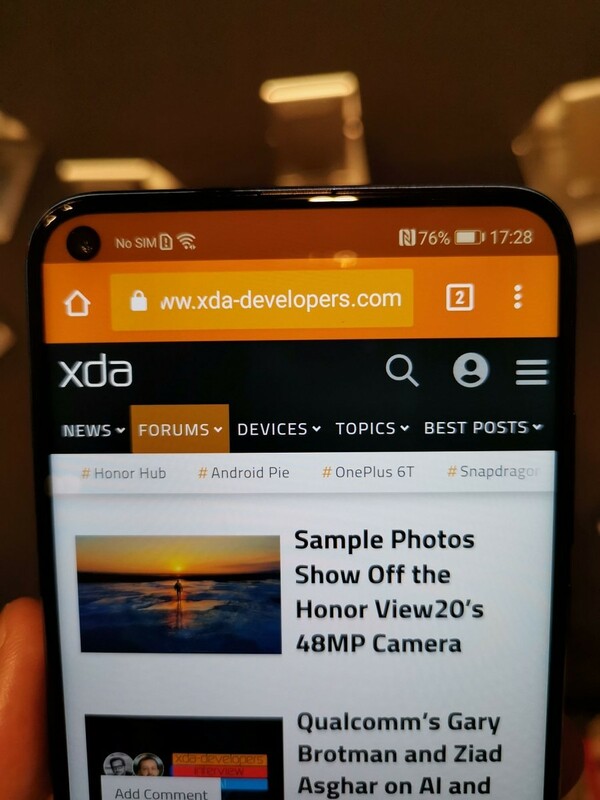 If you’re interested in getting this device, be sure to subscribe to our Honor View 20 forums with the XDA Labs app. Here you’ll find discussion about the device centered around news, tips, guides, apps, themes, and accessories. Sadly, don’t expect much custom ROM or kernel development. If you live in Los Angeles, you have a chance to see the device in-person. On Saturday, January 12th from 2:00PM to 4:00PM PST, TK Bay is hosting an event to let people see the device early. More details can be found in the thread linked below.